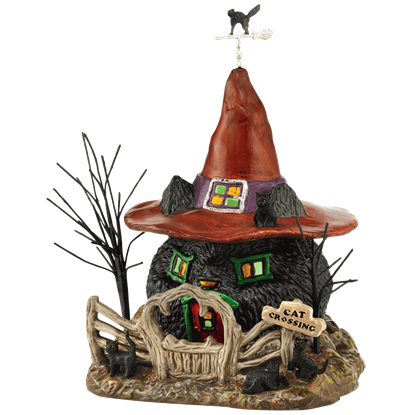 The spookiest neighborhood in any Halloween village, Witch Hallow plays host to the Black Cat Shack with its witch hat roof peak. The creepy cottage collectible resembles a cat and is inhabited by the scariest cat lady of all. The sign on the side of the Creepy Clown Car says, Send In The Clowns. 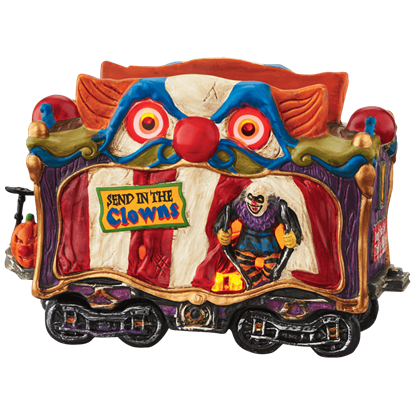 These clowns have taken it upon themselves to join the Halloween fun, working hard to escape from the circus train that has just pulled into town. 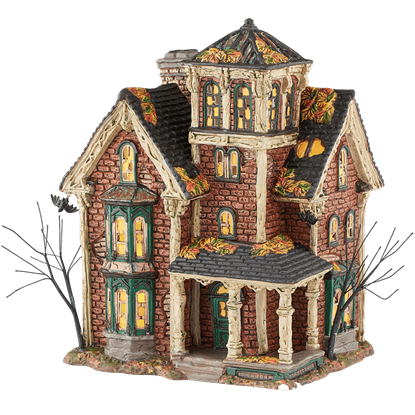 Bats hang from the eaves and autumn leaves adorn the roof of Ghastlys Haunted Villa, a collectible statue from the Halloween Village collection by Department 56. This abandoned mansion is illuminated from within by a green light bulb. 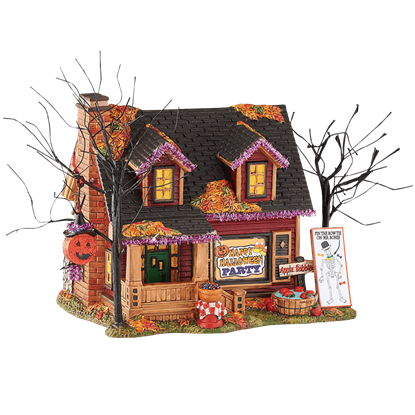 With games galore and fantastic, metallic and purple colored decorations adorning this festive home, the Halloween Party House, part of the Halloween Village collection by Department 56, is a fun-filled addition to any spooky village. Appearing at the center of town, this skeletal tree has been given adornment to decorate its bare branches. 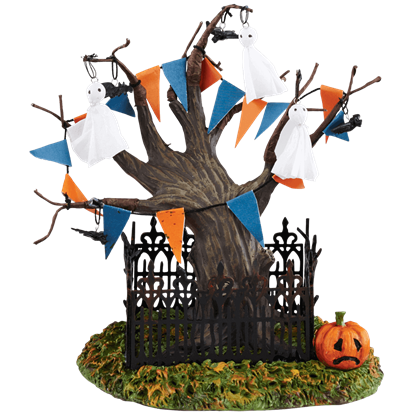 Orange and blue triangle banners have been draped over the Halloween Town Tree along with several ghostly figures. 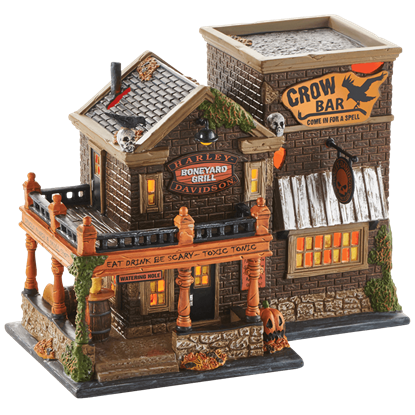 A frightfully awesome hangout after a day of riding with friends, the Harley Crow Bar invites you to come in for a spell to eat, drink, and be scary. Fun signage and graphics of skulls and crows blend for a unique character. 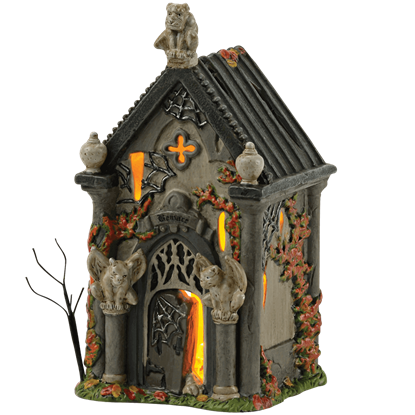 No spooky display should go without its own Haunted Crypt. 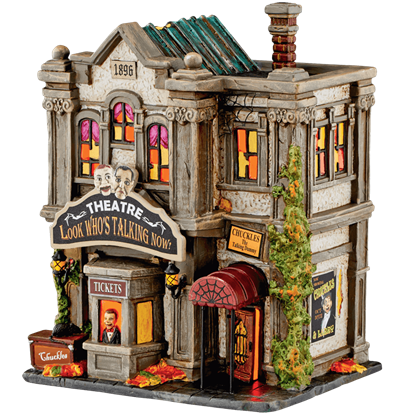 This hand painted statue, part of the Halloween Village collection by Department 56, is a great way to add a hint of eerie charm and dark intrigue to your autumnal home decor. 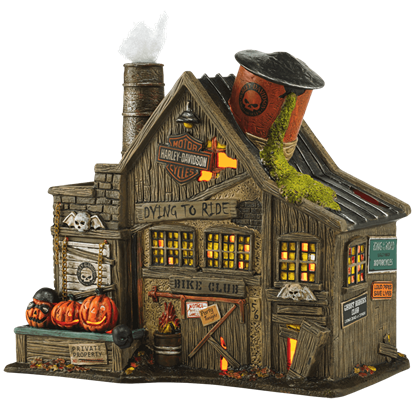 Licensed by Harley Davidson, the HD Ghost Riders Club serves as a great club house with its ramshackle appearance and handful of jack-o-lanterns. Ghost riders gather here on full moons, but not for long - they are dying to ride! The Look Whos Talking Now Theatre, part of the Halloween Village by Department 56, displays an eerie theatre illuminated from within by an orange glow. Above the ticket counter, a sign advertises a promising ventriloquist show. The train slows down at this haunted train station but never stops! 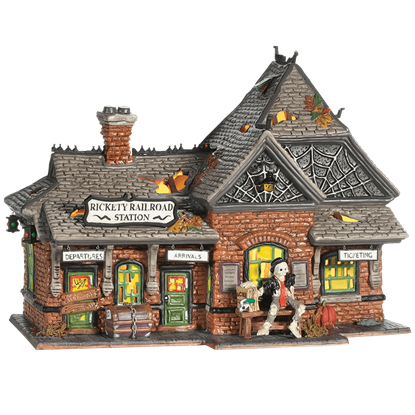 The ramshackle structure is spooky, and the sounds coming from within the Rickety Railroad Station are even spookier, making this a freaky addition to your town. This icky diner serves up the latest highway critter casualties through the front window. 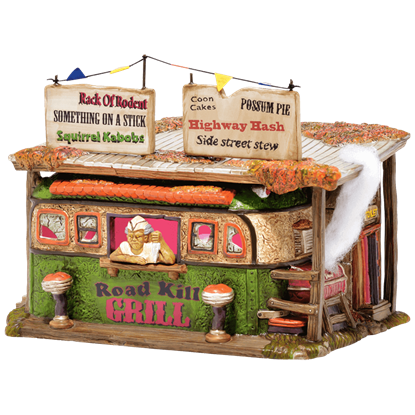 The Roadkill Grill specialties of the house include a wide number of unappetizing options for weary travelers to attempt to stomach. 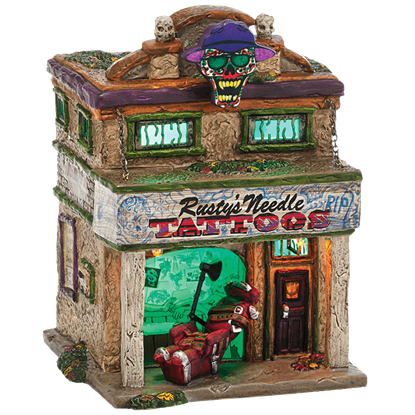 Business must be pretty good at the local tattoo parlor, Rustys Needle, since they just added another tattoo chair out front! Rustys chair is ready and waiting for the next victim - sorry, we meant to say customer!